PAUL BISHOP ~ WRITER: DO YOU KNOW MISS SLOANE? DO YOU KNOW MISS SLOANE? Jessica Chastain’s new movie Miss Sloane is getting a roasting from the critics who appear to have missed the whole point of the film. Despite its apparent focus on the unethical political maneuvering of Washington lobbyists and the hot button issue of gun control in America, Miss Sloane is about one thing only—Miss Sloane. Chastain is an intense actor and she brings every Machiavellian emotion she has ever encountered to manifest her portrayal of a single-minded individual, with a twisted labyrinth for a mind, who is fanatically dedicated to a single cause—winning. There are touches to her performance that pull her character back from the edge of full blown sociopathy, but it’s a dangerous balancing act. 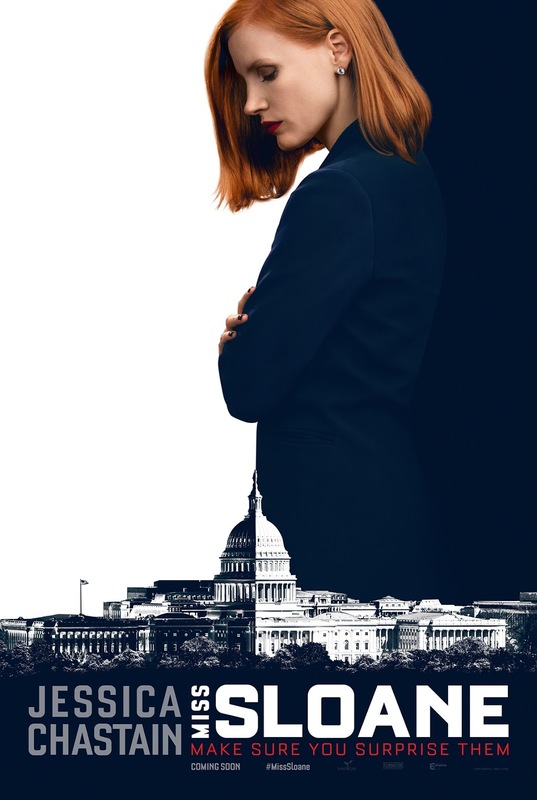 Miss Sloane isn’t about politics, lobbying, or gun control...it’s about character, one single solitary devious beyond imagination character put under the microscope. This is Jessica Chastain’s film from start to end, but she is ably buoyed by the supporting cast, especially Mark Strong as the likable boutique law firm owner who sets everything in motion, but quickly finds himself on the wrong end of what he wished for. He is the counterpoint to Chastain’s character that provides perspective. Many of the reviews who rant on and on about the amoral and unrealistic politics of the film (as if there is any morality and realism in current politics) leading to a fantasy conclusion again miss the point. As I watched Miss Sloane work her way through a film filled with rapid-fire Sorkin-like dialogue, Chastain’s performance sucked me into it’s wicked, convoluted heart, and gave me the biggest dose of climactic film satisfaction since The Accountant. I wanted Miss Sloane to win…I wanted her to bring a vengeance of comeuppance to every single one of her legion of enemies. When her final earthquake begins to shake I had a huge smile on my face and a black cheer in my black heart. Don’t be put off by the reviews and the naysayers. Don’t be put off thinking this is a political film or a message film. It isn’t any of those things. Go and see this film for its sharp performances, sharp script, and the anticipated, yet slam bang, perfectly in character ending. Miss Sloane gave me exactly what I want in a film—smart characters, intelligent dialogue, a storyline where the first scene comes back around in the last scene, and a satisfying experience that had me leaving the theatre with a smile while chattering with friends about the brilliant performances, the nuances of the script, and the mechanics of the film itself.